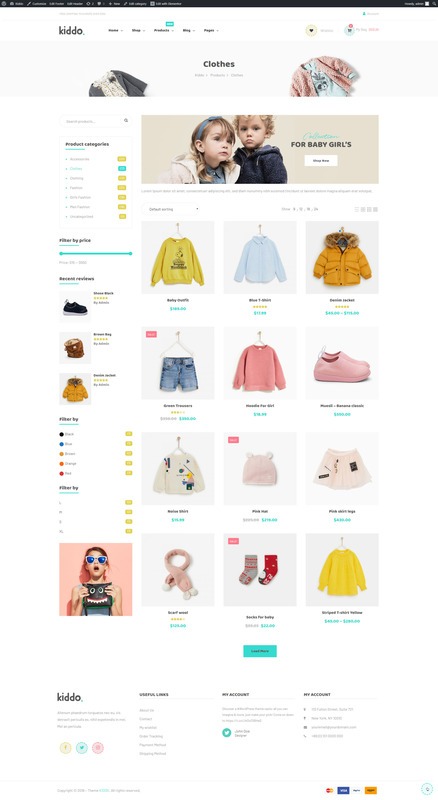 Kiddo is a modern and adorable Baby Shop & Kids Fashion WordPress theme. It’s right fit for selling baby fashion, kids fashion, baby clothing, kids clothing, kids outfits & baby shoes or other products for baby shop & kids store. With amazing look & feel, Kiddo will meet all your demand for building any lovely & stunning baby store & kids shop. 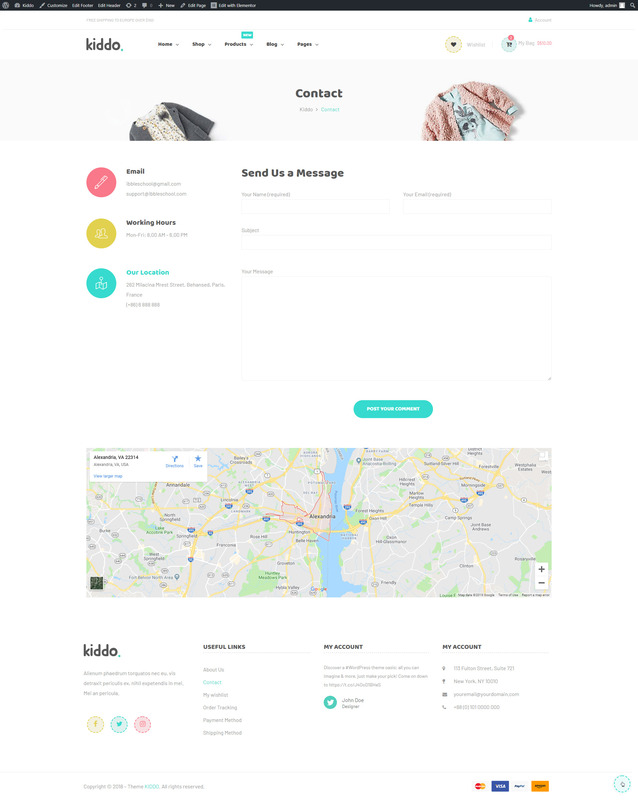 This theme is outstanding with 06+ amazing homepages easily imported by 1 click, multiple attractive styles to display shop item, shop page, blog page & single post. It comes with numerous useful inner pages to enhance customer shopping experience. Besides, Kiddo is well built with drag & drop page builder Elementor, flexible effects & animations, many compatible plugins and other fantastic built-in features. Our WordPress theme makes everything simple for you to create your own baby & kids store in real time without coding touch. Let’s explore how incredible it is! >> Why people fall in love with Kiddo? You can choose the most suitable template among stunning pre-designed homepage layouts that can be quickly imported by 1 click. Kiddo provides you multiple designs to showcase your shop page with all baby & kids products in a smart way. What types of items you can sell on your baby & kids product website? All product types are supported: simple product, variable product, external/affiliate product, grouped product. Also, with our Kids Fashion WordPress theme, you can show off your products in shop page flexibly with details. Select the most favorite style we pre-design for you! It will be interesting when you can choose the best way your single product page displayed with image, description, reviews and other information. Our fashion WordPress theme for baby, kids & children will help you to do this. Blogging is one of the most effective marketing strategies to polish any website. That’s why we offer you a variety of styles to display your blog page layout professionally. Choose a proper design to arrange your blogs now! There are two available styles for you to show your single blog posts. Pick yours! More importantly, what makes your all single posts special and engaging to customers? Let’s make them more interesting with gallery, video, audio, or quote. Our Kiddo supports you to add any type into your posts. You shouldn’t miss out other functional pages that will complete your baby store & kids shop website and make it more reliable. 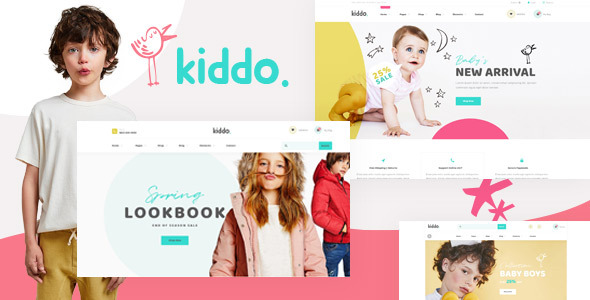 Kiddo baby & kids shop Wordpress theme not only performs a stunning appearance but also is packed with lots of powerful functionalities to power your website and improve customer experience. Hence, there’s no doubt that this theme is worth considering a perfect solution for any baby online store & kids website. You can decide how your website appears on any device because Kiddo is fully responsive and retina ready. The newest drag & drop page builder Elementor allows you to customize all elements of your website in real time without coding skills and see your work instantly. With high speed optimized, Kiddo is perfect for SEO and visitors when surfing your website. Also, it’s super simple to customize your website thanks to awesome easy-to-use options. What’s more? With endless color typos, you can adopt the theme to your corporate colors flexibly. Besides, Kiddo comes with not only dedicated mega menu but also diverse header & footer to build your ideal baby kids online store. Kiddo is bundled with 08+ powerful plugins to boost your website performance. Which plugins will you get free when owning our theme? Slider Revolution, Elementor, WooCommerce, SEO Ready, MailChimp, One-click Install, RTL Translate & Contact Form 7. Detailed documentation for installation & usage of the theme is available for you. Also, our dedicated support team are willing to help you anytime you get any issue. 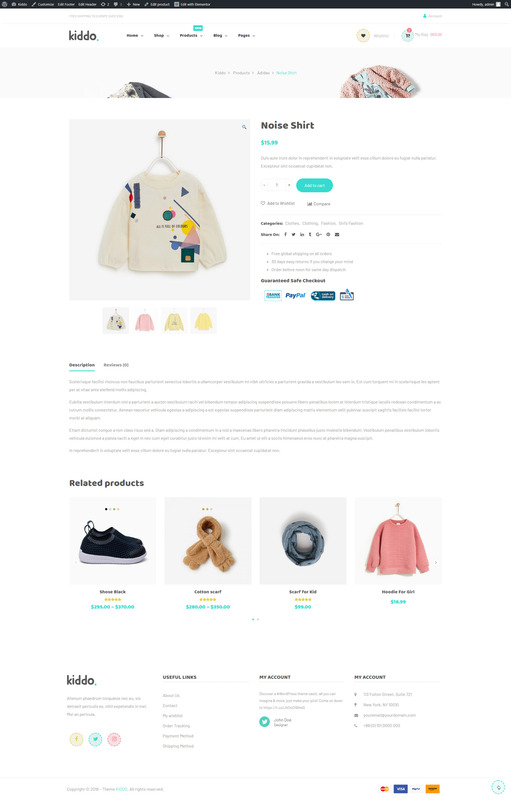 Let’s check our WooCommerce WordPress Theme for Baby Kids Fashion, you will be surprised!